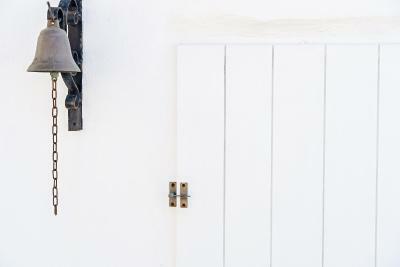 Lock in a great price for Agali Houses - rated 9.2 by recent guests. The staff are the fundamental reason behind the excellence of this hotel. They go above and beyond to ensure me and my friends had a great experience and appreciate the efforts made to make it a great holiday for us. 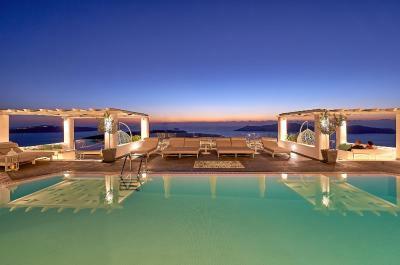 Superb location, the most friendly helpful staff you could wish for, spotlessly clean with great facilities. 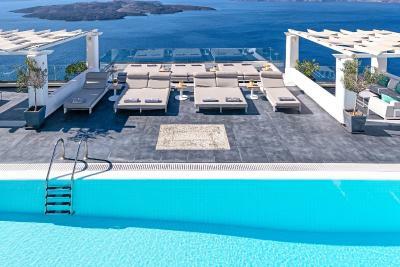 We would definitely stay here again. The staff were very courteous, friendly and helpful. It honestly was the best place we have ever stayed. 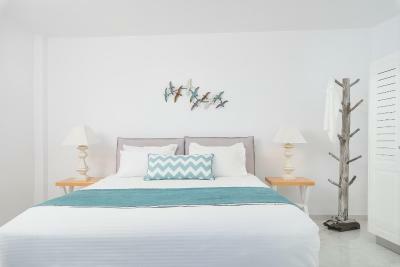 The staff were so accommodating and the rooms and veiws beyond expectation. 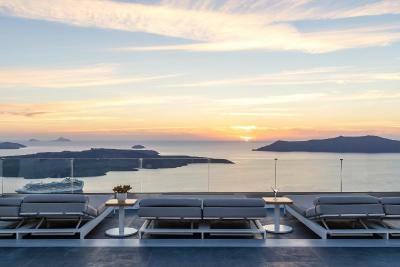 If we are ever lucky enough to come to Santorini again, we will stay here. It's a short walk to Firi the main town, but definitely has better veiws! 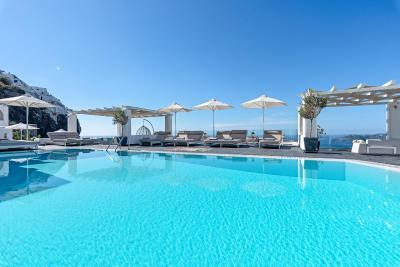 A stunning place, you will not regret booking here! Views were spectacular and the position was perfect. Beds so comfortable. All staff very friendly and helpful. 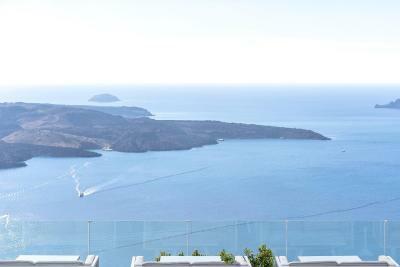 Views are absolutely stunning overlooking the Caldera! 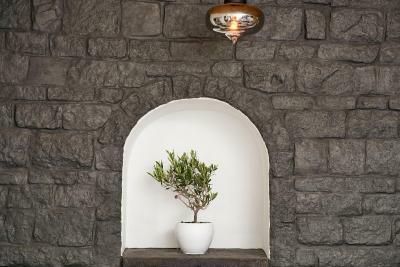 Location is very good, close to good restaurants, town and bus station. Room was clean and spacious. The service - in particular Borra in reception. The view is amazing. The facilities are great. 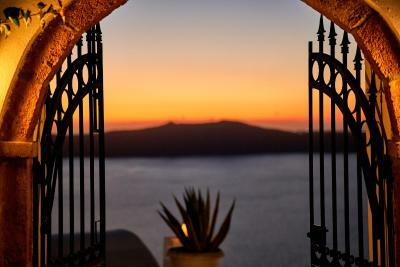 One of our top picks in Firostefani.Perched on Caldera cliff, in Firostefani Village, the Cycladic-style Agali Houses features a swimming pool and a furnished sun terrace with panoramic views over the sea and the Volcano. Free WiFi is provided throughout. 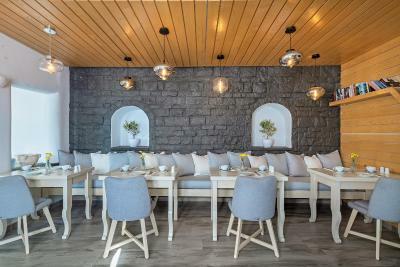 Overlooking the Caldera from their private balcony or terrace, the air-conditioned rooms and suites of Agali are fitted with arched walls and white-wooden furnishings. Some units come with a private swimming pool or outdoor hot tub. Buffet breakfast can be enjoyed either at the breakfast area or at the terrace. Refreshing cocktails and snacks can be enjoyed at the pool bar. 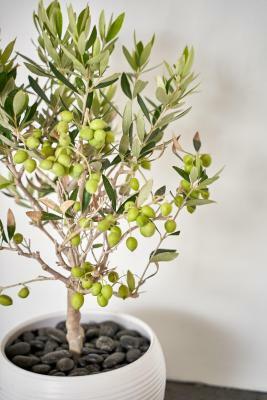 Massage treatments can be arranged upon request, while a small library is also available on site. Car rental and luggage storage services can be provided, while tickets for excursion and restaurant reservations can be also arranged. 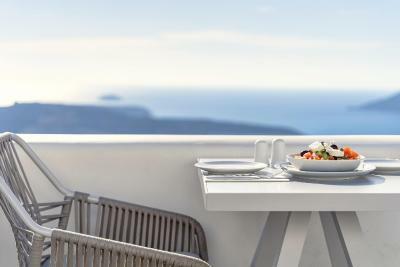 Guests will find a variety of restaurants, bars and shops at the centre of Fira, located within a 10-minute walk from the property. 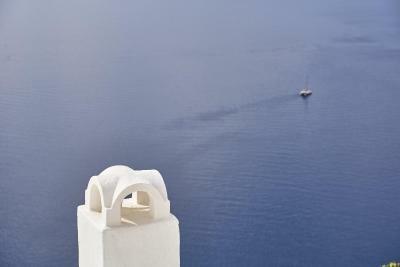 Ormos Athinios Port is 3.7 miles away. Free public parking is possible nearby. Agali Houses has been welcoming Booking.com guests since 6 Feb 2009. When would you like to stay at Agali Houses? 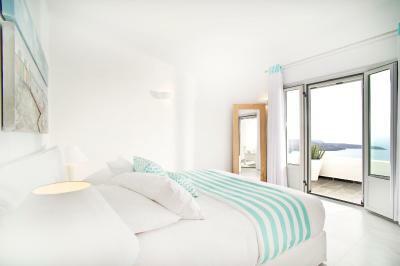 The room offers an open-plan bedroom with a seating area and a private bathroom. 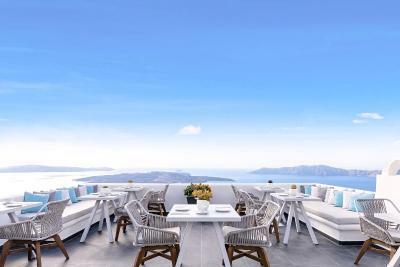 It also offers a private furnished balcony or terrace with sunset and caldera views. Free WiFi is provided. The room comprises of a bedroom and a living room with a sofa. Free WiFi is provided. 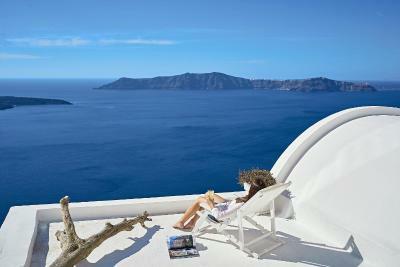 The private veranda or balcony is appointed with sunbeds and offers Caldera and sunset views. 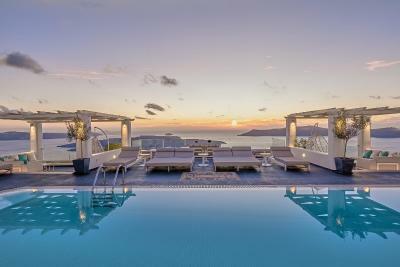 The Sunset Suite features a spacious 50 square metres within a two-level space. 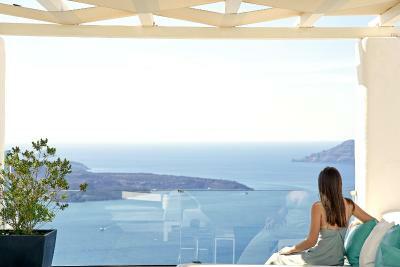 Enjoy the spectacular views of the volcano scenery from a private terrace and swimming pool. It also features a spacious living room. 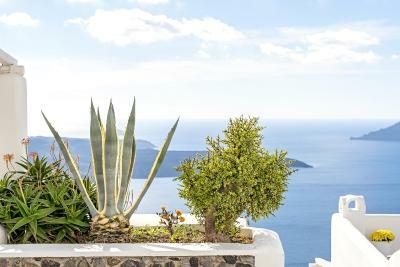 The private bathroom boasts Caldera views. Free WiFi is provided. 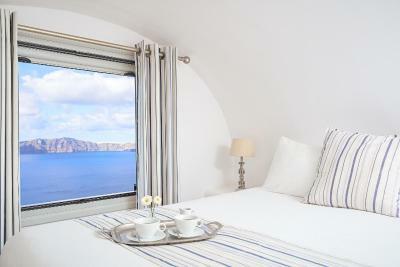 Elegant suite offering Caldera views from the furnished terrace and the comfort of your bed. 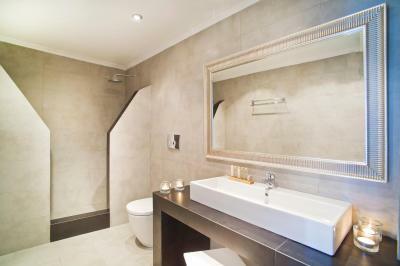 Its private bathroom is stocked with a walk-in shower. Free WiFi is provided. 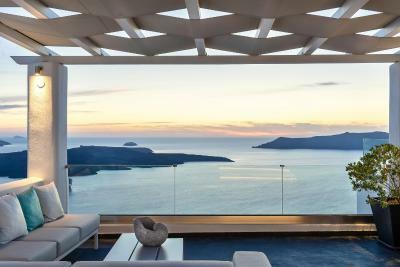 Opening to a private balcony, this open-plan room features an outdoor hot tub and Caldera views. Free WiFi is provided. 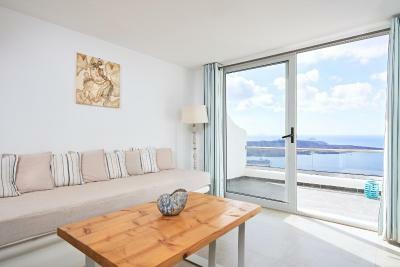 Split-level suite opening to 2 furnished balconies with Caldera views. 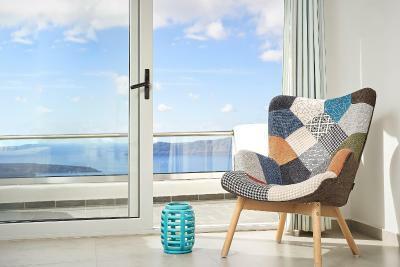 It also features 2 bedrooms, spacious living room and free WiFi. 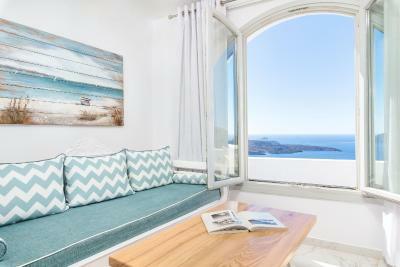 Opening to a furnished balcony with Caldera views, this open-plan room offers free WiFi. 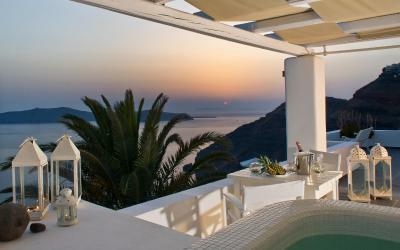 This suite opens to a furnished terrace with a hot tub and Caldera views. It also features a spacious living room and free WiFi. 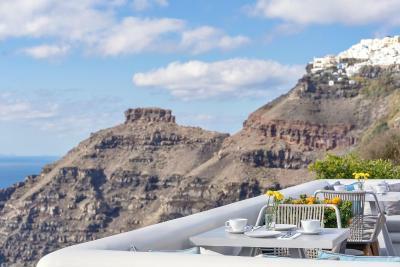 Opening to a furnished terrace with Caldera views, this spacious suite features a living room, separate bedroom and free WiFi. It can accommodate up to 3 guests. House rules Agali Houses takes special requests - add in the next step! Agali Houses accepts these cards and reserves the right to temporarily hold an amount prior to arrival. Please inform Agali Houses in advance of your expected arrival time. You can use the Special Requests box when booking, or contact the property directly with the contact details provided in your confirmation. 164 steps down to room and then 164 steps back up to main road!! Comfortable room, excellent breakfast available, friendly helpful staff, and an amazing view. The communication could’ve been better in terms of information regarding excursions booked through them. Some of the information was unclear/false and on the day of given different information. Nonetheless a great trip. The view, staff and facilities are all great. Note: Our location required going up and down 100 stairs from the road to reception and another 80 to our room. Difficult but not impossible. No available cooking in room. Small water heater. We are in our 60's and 70's and we would all definitely return. This place is AMAZING. SUPERB VIEW FROM OUR BALCONY. CANNOT BE BEAT. We would love to return . Location location and staff fabulous. Even though we received a free upgrade to one of the best rooms in the hotel, its furnitures and facilities are quite surprisingly basic. We did not like the small bathroom. There was no glass partition or curtain for the shower that keeps the water from splashing all over the bathroom. 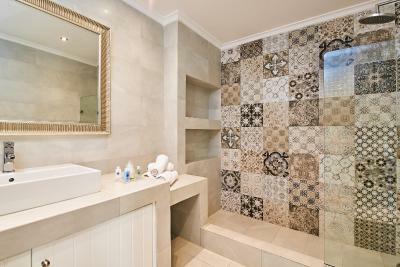 The placement of the showerhead was odd and clumsy, and the bathroom has no power outlet for the hair-dryer or other appliances. There was only one complementary bottle of water and it was tough to have to buy drinking water from outside and bring it down to the room, descending so many steps. 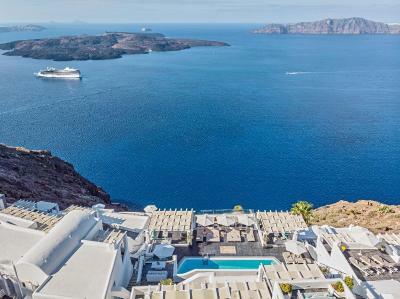 The most serious drawback of all hotels in this area is the fact that there is no escalator or elevator, and as the hotel rooms are built on a cliff, overlooking the sea, climbing a hundred steps up and down to go anywhere would be a serious challenge to older guests or those with disability. Even young people would have to stop and catch their breath every time when leaving the hotel to go up to the main street. 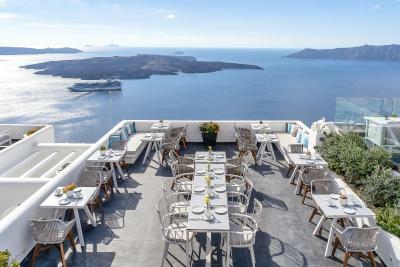 In addition, the hotel's breakfast is too expensive at 15 euro per person per day, with its sufficient but limited selection of food. 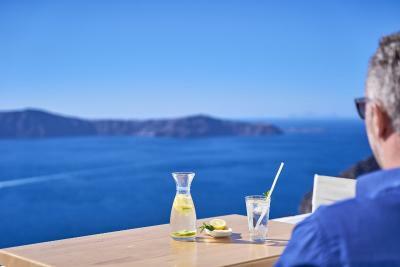 Like all hotels and restaurants in Santorini, the cost of services mainly depend on the view over the caldera. Finally, while the hotel has a great swimming pool, its water was too cold for guests to use even though the weather was quite pleasant. There was no effort to warm up the pool so that guests could use the service, which would be a highlight of their experience there considering the beautiful ambiance around it. 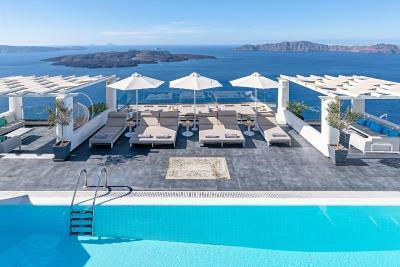 The views from every room, the pool area, the restaurants and surrounding facilities are perhaps among the most awesome in the world, with panoramic vistas of the caldera, the volcano island and other rocky islands rising from the deep blue waters. 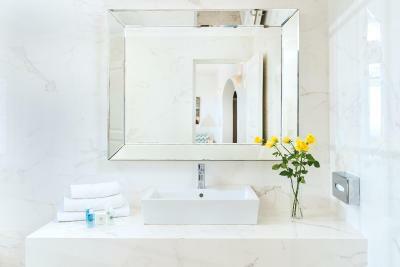 The ambiance of the hotel is extremely elegant and picturesque. The staff courteous and the porter that helps bring the luggages up and down the steep, long stairs could not have been more helpful and courteous. 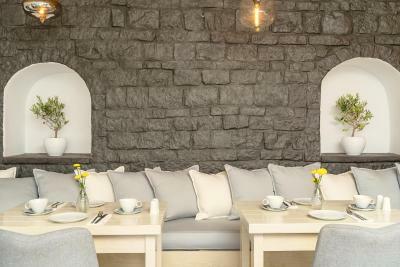 The hotel is surrounded by many restaurants and gift shops, together with tourist offices. 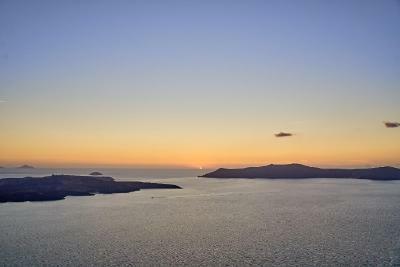 We particularly love the convenient seaside pathways connecting the hotel to Fira, the heart of the town, which is only fifteen minutes away on foot. The steep walk up to the top was a challenge even for younger people. The location was perfect. Our room was spacious, clean and had a balcony with a beautiful sunset view! The staff could not have been nicer and very helpful arranging transportation. The food from the restaurant was wonderful! It would be great to have a long hot shower but the hot water didn’t even last for one person. The breakfast was also a little disappointing. The steps! 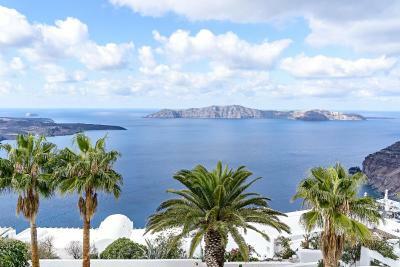 Forget the Gym, Santorini will give you a great workout. Luckily they had a very fit Porter to carry bags up and down the steps from the main road which was only about 50 metres.